Metadata tagger for mp4 files. Is there a better alternative to MetaX? Is MetaX really the best app in Video category? Will MetaX work good on macOS 10.13.4? Editor's Note: MetaX is no longer being developed, nor does the developer seem to be providing any form of support. MetaX's successor, MetaZ, is available here. 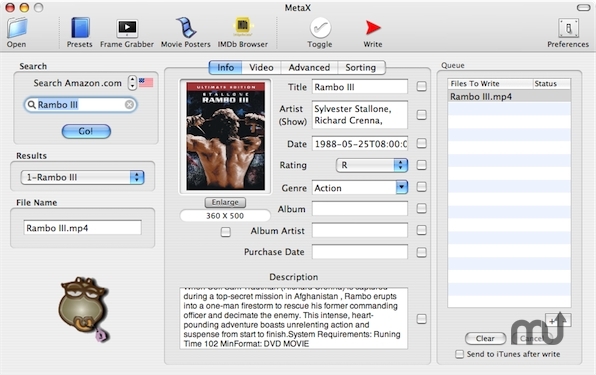 MetaX is a free meta-data tagging application for mp4 files and their derivatives. It uses Atomic Parsley on the back-end for tag writing. Tags can be imported automatically from Amazon.com or typed/dragged in by the user. Cover art tags can be retrieved from Amazon.com, Yahoo!, or from the movie frames themselves. Share your tag data with friends using the new archive export feature.